I was already a big fan of Star Hammer: The Vanguard Prophecy, back when I played it on my PC. But now that it’s on a platform I actually like to play games on, I like it even more. Related reading: My review of the original release of Star Hammer on PC. 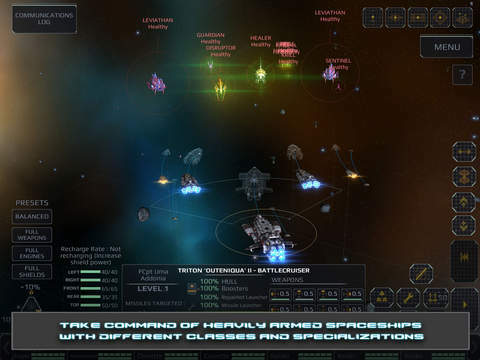 Star Hammer is a particularly complex and involved tactics strategy game, set in the vast reaches of space. Players take control of an initially small, but growing fleet of starships, and shoot lasers and torpedoes at enemies that cover the gamut of science fiction stereotypes, from rebel fighters through to alien monstrosities straight out of a H.P. Lovecraft narrative. Across 60 odd missions, with branching paths that adapt the narrative based on the decisions that players make, they’ll be flying around space and taking down enemy forces in open arenas, all the while managing everything from the energy balance between shields, weapons and speed, to the elevation relative to their opponents, and on to the deployment of special weapons and the different turning arcs for nimble fighters when compared to hulking battle cruisers. The heavy emphasis on science fiction mechanics, such that balance between weapons and shields, will be immediately appealing to the Star Trek and other pulp sci-fi fans out there. The cool neon interface also helps to build that slick sci-fi atmosphere, to help you feel like you are a commander, standing on the brig of a starship somewhere, manipulating units as you send them to war. Being honest, the narrative isn’t especially engaging, though it fits with the mechanics and aesthetics to help build the kind of B-grade nonsense that the game’s target audience – sci-fi fans – will enjoy despite its flaws. Beyond providing a context that allows for branching narrative paths (and thus different combat scenarios, depending on play preference), the specifics of the story aren’t even that important, so it’s difficult to actually criticise the game for it. In every other area, however, Star Hammer: The Vanguard Prophecy truly excels. The combat system is deep and engaging, providing plenty of strategic options that equally enable a player that wants to be cautious, aggressive, or take on a more probing style of play. There are moments where I have managed to save the lives of precious units by stalling them in the middle of an enemy barrage, redirecting all their energy to the shields, and allowing to withstand some concentrated fire for a few moments while allied ships came the rescue. Because combat is at a tactical level, with a handful of units on each side at most, every one of them matters, and regardless of the game’s narrative weaknesses you’ll find yourself caring for each individual unit as is accumulates experience form one battle to the next and develops into an experienced veteran fighter and truly precious military resource. The way the game makes use of time is another fascinating, and greatly enjoyable element. 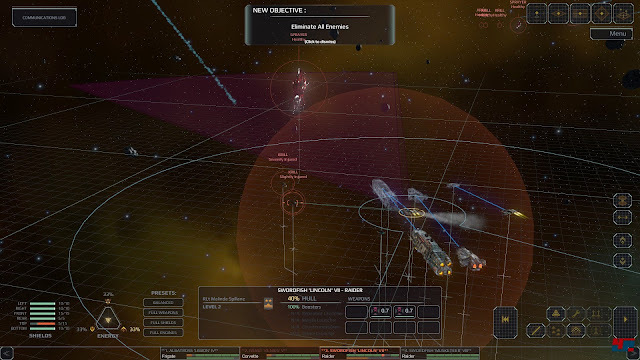 There has been an increasing trend in modern serious strategy games towards a simultaneous turn-based style of play, where both sides of a conflict will input their commands at the same time, and these will then play out in real time once both sides have finished with the command phase. I prefer this to a more traditional turn-based structure, and the reason is relatively straightforward; a simultaneous turn-based approach to combat allows for all the strategic complexity of turn based strategy (as players have time to digest extreme amounts of information before making a turn, a luxury not provided to them in a RTS game), but at the same time creating the uncertainty around enemy movements of a RTS. In Star Hammer, you can’t be 100 per cent sure what your opponent is going to do in a turn, meaning that certain maneuvers will be risky (as they might rely on an opponent behaving in a certain manner). Trying to read the mind of the enemy in an almost real-time fashion opens up an additional layer of strategy that real turn-based games don’t have, which deepens what is already a very deep tactical game. That being said, the more I play Star Hammer against the AI (and remember, I have been playing it for months now), the more I find it a little too predictable for its own good. It’s about as good as you could expect from a small indie team; in fact, that’s being disingenuous – Star Hammer has AI routines that punch well above what you’d expect from a small indie team. But at the same time, lacking the depth of your typical Paradox title, Star Hammer’s long term replay value starts to fade because it becomes all too easy to preempt enemy strategies. This is especially affected by the lack of an online multiplayer. There’s a skirmish mode for players to create their own scenarios outside of the campaign (and high scores to provide some boasting power), but the lack of human intelligence to compete against for a game that is complex enough that mastering it has value is disappointing. 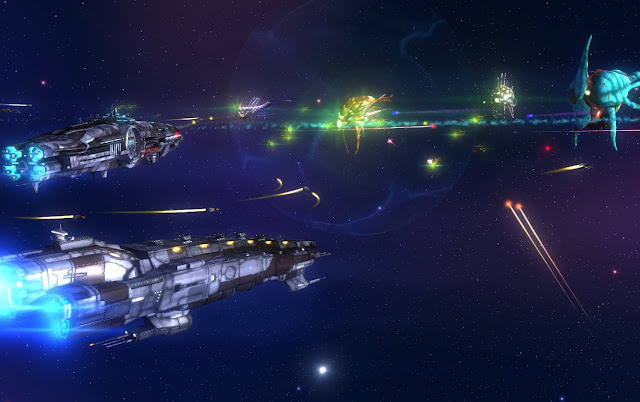 On a presentation level, however, Star Hammer is gorgeous. 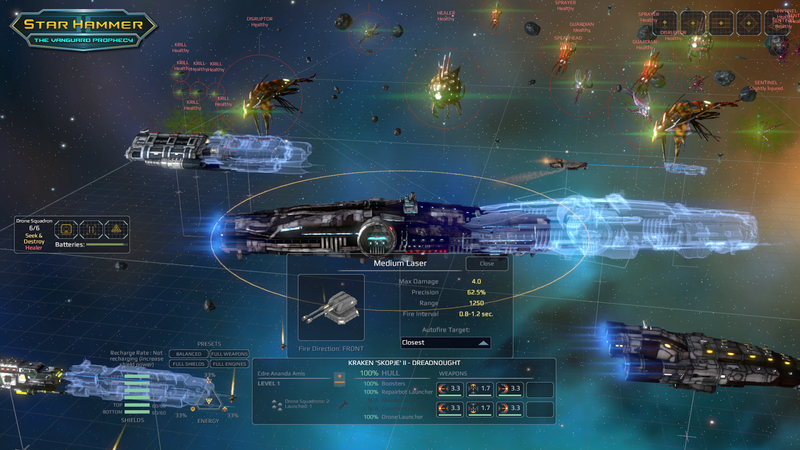 The vast reaches of space are a difficult proposition for wargames, as the whole point of the environment is that it is meant to look vast, and the objects within it relatively small, and the game succeeds there. I would find myself constantly tweaking the camera angle to make the action look as cinematic as possible. The interface is complex and takes up a good portion of the screen, but the data on display enough like a Star Trek-style science fiction tale that it was instantly inviting to me. And it must be said that actually playing it on the iPad is a dream. Zooming, panning, and manoeuvring units is a snap on the touch screen, and the effect of directly interacting with that screen feels very much like interacting with a control panel on an actual starship. The clinical coldness of a mouse pointer with the PC version is very much upstaged here, and I can’t see myself going back to playing it on PC now that I have it on my iPad. There is room for Star Hammer to grow as a franchise. A sequel would really need a multiplayer mode, and there’s too much potential in the narrative and universe to leave it as underdone as this, but the basis is there. The tactical strategy on offer is complex and rich enough that you’ll want to master it, and the touch interface works so well that this is really the definitive version. In a year loaded with quality Aussie-developed games, Star Hammer: The Vanguard Prophecy flew a little under the radar, but it deserves notice as one of the best games we’ve produced in quite some time. Item Reviewed: Review: Star Hammer: The Vanguard Prophecy (Apple iPad) 9 out of 10 based on 10 ratings. 9 user reviews.